.. the last of the wedding pictures, I promise. 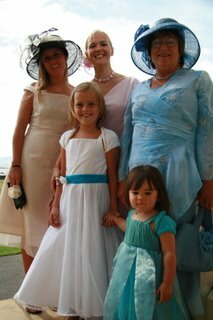 This all the other outfits I made for the wedding in August. My younger cousin and her daughter, my lovely Mum who was gorgeous in blue and last but not least my darling angel niece, otherwise known as the fairy princess. Off to french class this morning which I love, love, love, NOT! Tchao.